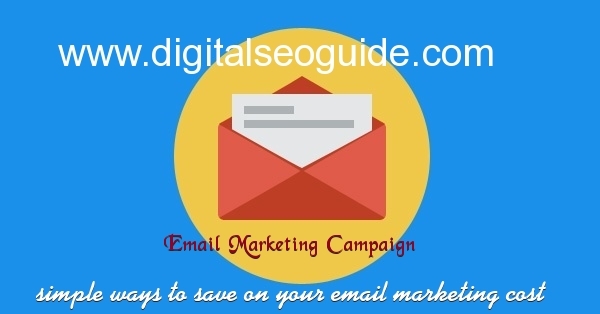 Simple ways to save on your email marketing campaigns cost. People spend fortunes on email marketing campaigns only to get a reduced return and then some spend their intellect before starting off only to slowly utilize ideas that work, and get them increased return in the form of traffic, referrals and sales. If you have been thinking about saving on your ambitious email marketing, read this article; now! Some argue the credibility of email marketing in this age; mainly because they think when we have better scope to arrive at a logical return from other forms of advertisements such as search advertising, direct mail coupon mailers, social media marketing, traditional advertising; which yield better revenues; then why email marketing campaigns. But then email marketing is still relevant today, because if carried out well; it can get you some good returns. But for that, you need to have patience, ideas, and a launch pad that can take your brand to the audience who want to buy your product/services. Depending on the audience and type of message you are sending, you need to follow some basic rules. If you do not follow the rules, chances are you could get blacklisted as a spam, so if you to send more messages; it is a good idea to start with email service providers who provide flexible plans. Why outsource your design task for a template when your email service provider provides one free of cost? You can choose the one that suits your audience. a. Ask for a list that is latest and relevant. This ensures you send the email to an actual audience. b. When you ask for a list, tell the service provider to discount the list from your own list. c. Stick to the services of an honest email company. Before selecting a costly package for your email marketing campaigns, ask around for a good return choice and stick to the features provided. Do not necessarily opt for the solutions of a company that provides you with expensive service without any tracking benefit. A company that provides you track solution is good to hire. Once you save your money, you can spend the saved money on some other things and thereby improve your scope to earn revenue.